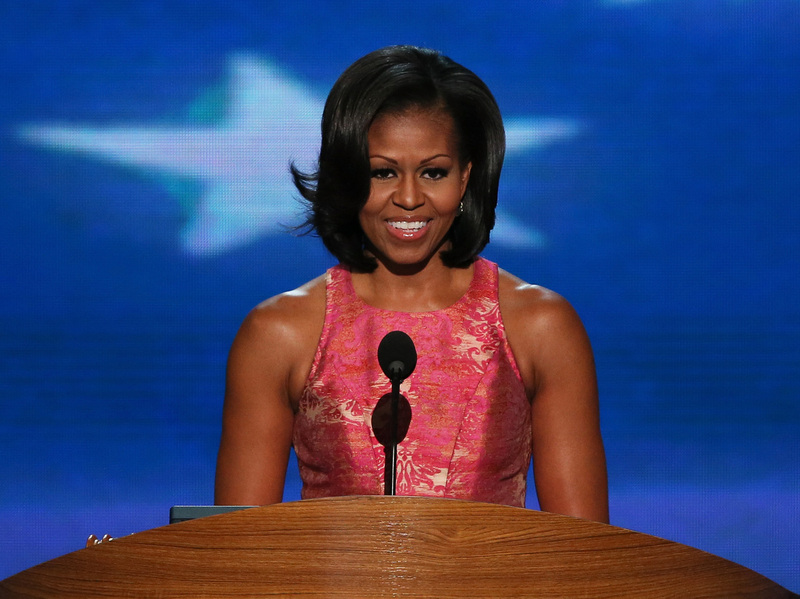 Transcript: Michelle Obama's Convention Speech Transcript of first lady Michelle Obama's speech at the Democratic National Convention. Thank you so much, Elaine...we are so grateful for your family's service and sacrifice...and we will always have your back. I've seen it in people who become heroes at a moment's notice, diving into harm's way to save others...flying across the country to put out a fire...driving for hours to bail out a flooded town. And I've seen it in our men and women in uniform and our proud military families...in wounded warriors who tell me they're not just going to walk again, they're going to run, and they're going to run marathons...in the young man blinded by a bomb in Afghanistan who said, simply, "...I'd give my eyes 100 times again to have the chance to do what I have done and what I can still do." Every day, the people I meet inspire me...every day, they make me proud...every day they remind me how blessed we are to live in the greatest nation on earth. First lady Michelle Obama addresses the DNC after being introduced by military mom Elaine Brye, from PBS NewsHour. And even as a kid, I knew there were plenty of days when he was in pain...I knew there were plenty of mornings when it was a struggle for him to simply get out of bed. And when he returned home after a long day's work, my brother and I would stand at the top of the stairs to our little apartment, patiently waiting to greet him...watching as he reached down to lift one leg, and then the other, to slowly climb his way into our arms. But despite these challenges, my dad hardly ever missed a day of work...he and my mom were determined to give me and my brother the kind of education they could only dream of. He was so proud to be sending his kids to college...and he made sure we never missed a registration deadline because his check was late. Barack's grandmother started out as a secretary at a community bank...and she moved quickly up the ranks...but like so many women, she hit a glass ceiling. But day after day, she kept on waking up at dawn to catch the bus...arriving at work before anyone else...giving her best without complaint or regret. He did it because he believes that here in America, our grandparents should be able to afford their medicine...our kids should be able to see a doctor when they're sick...and no one in this country should ever go broke because of an accident or illness. And he believes that women are more than capable of making our own choices about our bodies and our health care...that's what my husband stands for.